Excited to be partnering with Walmart today to show you an affordable (and really cute) spring outfit that is easily a go-to look of mine. What I love about this look is that it looks great on everyone and available to everyone via Walmart! It's really easy to wear and style -- no matter what look you're trying to create with it. If you wanted to switch out the slides for sneaker (these are my favorite white sneakers) for a laid back vibe or pair the whole look with a camo jacket for a more utility look it can be done. I obviously went for a more preppy/cool costal cottons look with lots of blue and white, big pearls and a fun clutch -- its just very me. Especially around spring I want to break out all the white jeans and cute sandals. But what I really love most about this look is that everything (outside of my sunglasses, sorry!) is extremely affordable. There is nothing better than putting together a look that makes you feel like a million bucks but wont actually cost that much. 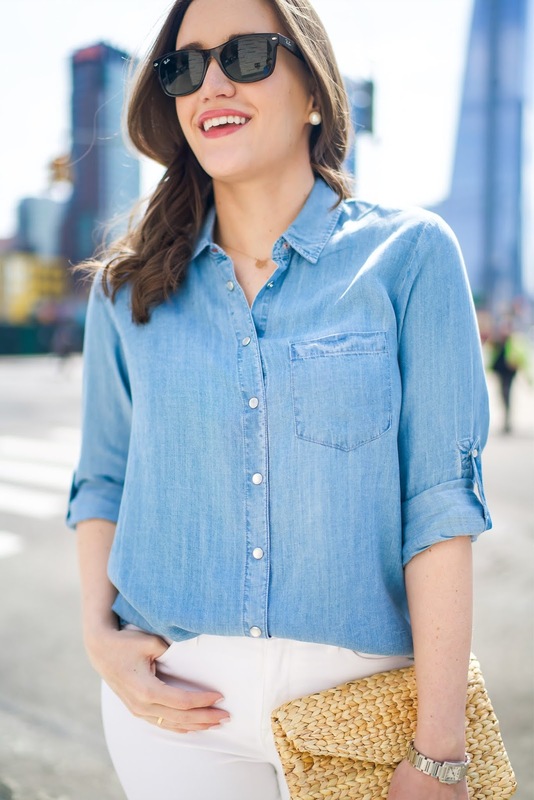 This chambray top is super soft and the perfect loose chambray top you need in your closet. I bought it in my normal size M and it fits great. For $20 -- you can't beat it! 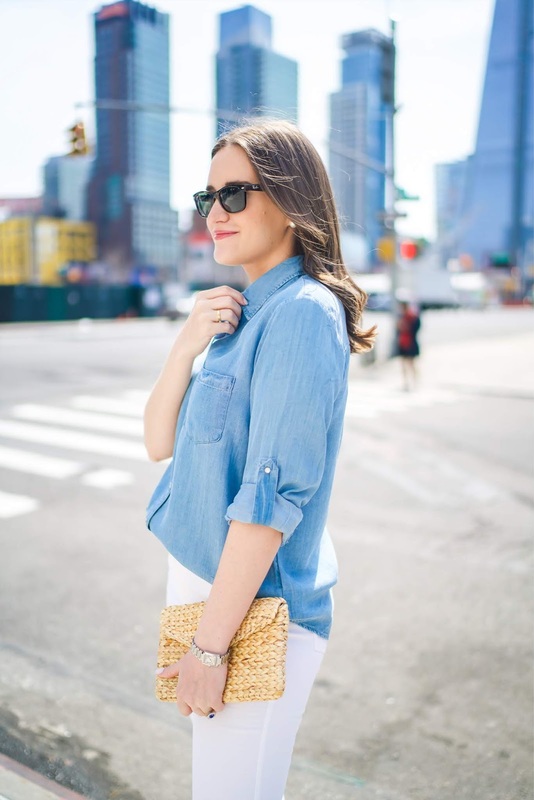 It's close to being sold out so I would check out the same top in white (would be cute in reverse of this outfit with a blue jean on the bottom), this other chambray top for the same price, or a chambray style dress which would also look just as good with the same slides. Also excited to find a great pair of white jeans for less than $23! These jeans I bought in a size 8 (my normal size) and are really comfortable and not see through except around the pockets but I feel like that is to be expected. These are great for fellow girls like myself with some curves who need a little bit of stretch to their denim. As for my accessories -- I felt like they all really helped bring the look to life. These slides were bought on a total whim because I couldn't beat the price. I felt like having a little something denim/blue related to tie it all together and I couldn't be happier with these shoes. Also, did you know that they sell Ray-Ban at Walmart? In addition to their own line of clothes, they also sell premium clothing and accessories! Aka this is the one stop shop to buy high and low (and I love it). 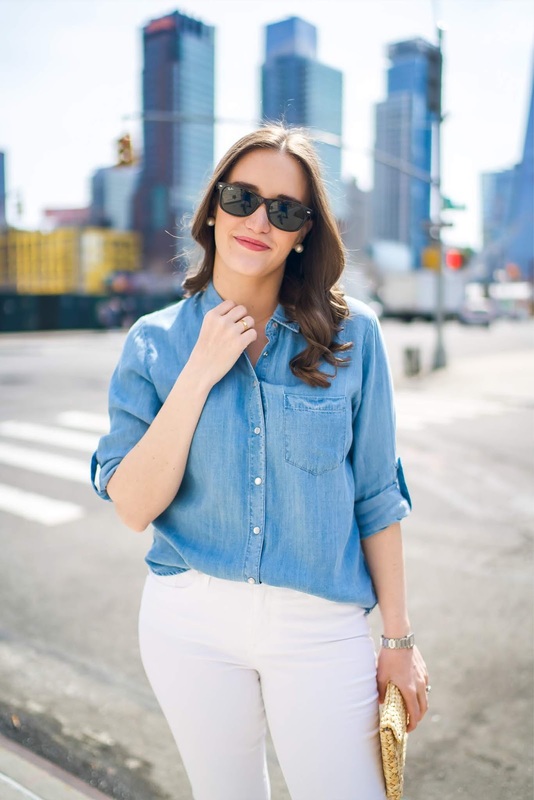 We had a wonderful weekend in New York weather wise -- this was one of the first times this year where we were able to shoot when it was sunny and close to 70 degrees! That means spring is all but basically here (now lets hope it stays). Thanks to Walmart for sponsoring today's post! That's a gorgeous look, I love the combination of white and blue in the spring. I have a denim shirt that I rarely wear because I never really know how to style it and I don't like to wear it with denim jeans so thanks for the inspiration, I'm gonna see if I can try a new look with it. This is SUCH a good Spring look! Love the blues with white! 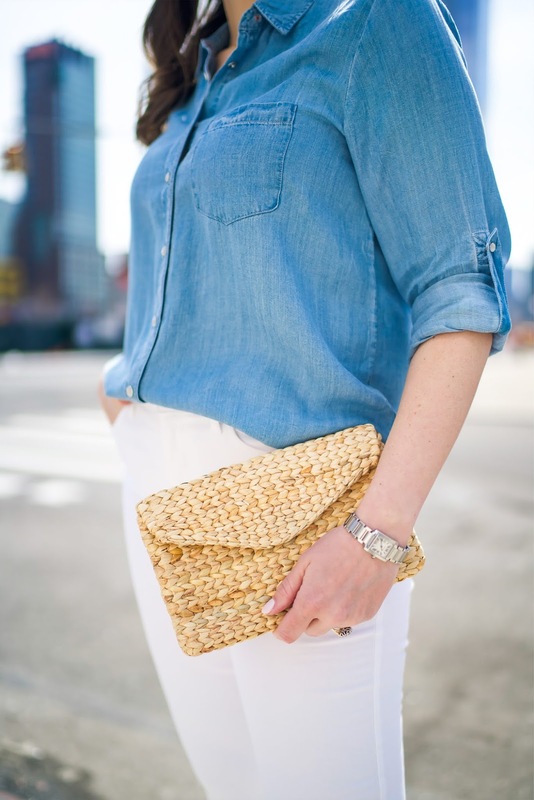 IN LOVE with this clean, breezy looking spring look!! I loved the weather this weekend, but why did it go back down to 30 degrees yesterday and today...super sad face lol!